Disclaimer: This post is sponsored by Straus Family Creamery. All opinions are my own. 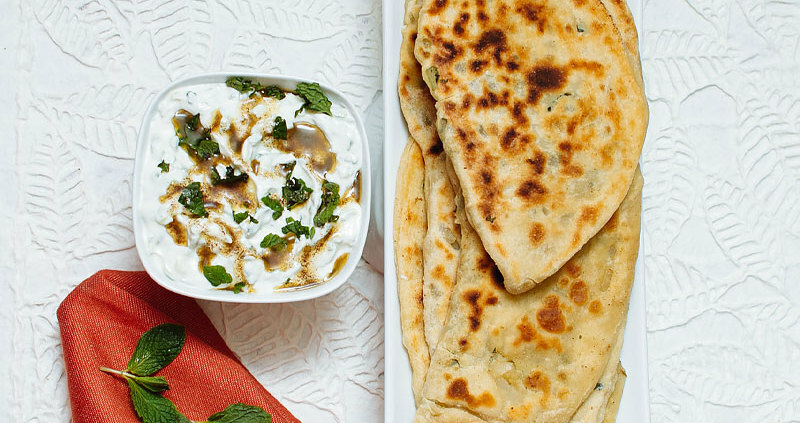 If you’ve never heard of kulcha, you may have heard of her cousin, naan. Both of these Indian flat breads use all-purpose flour; the primary difference is the leavening agent. 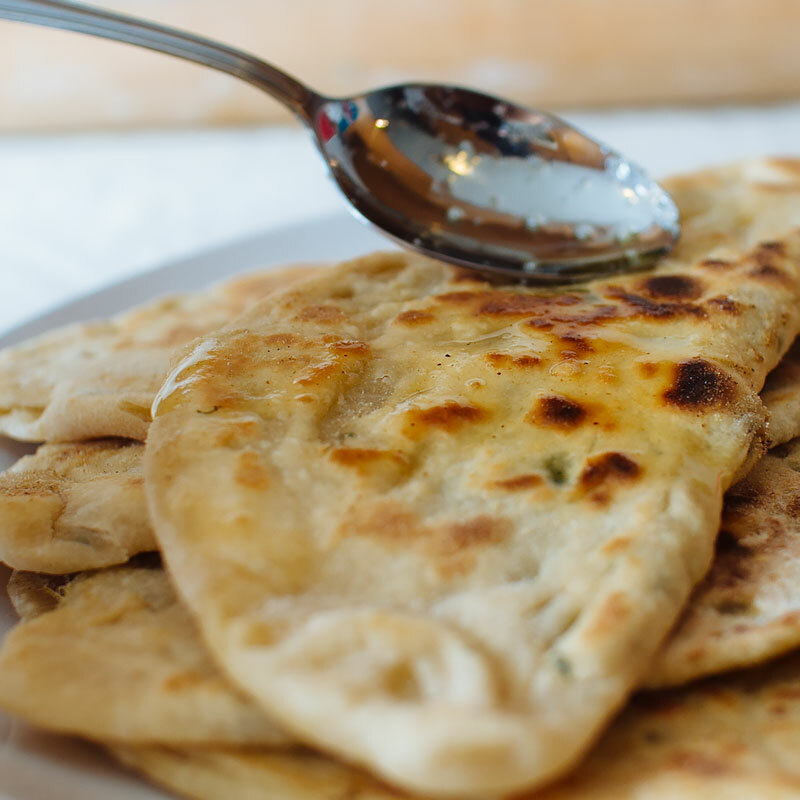 Kulcha uses baking powder and baking soda, while naan uses yeast. 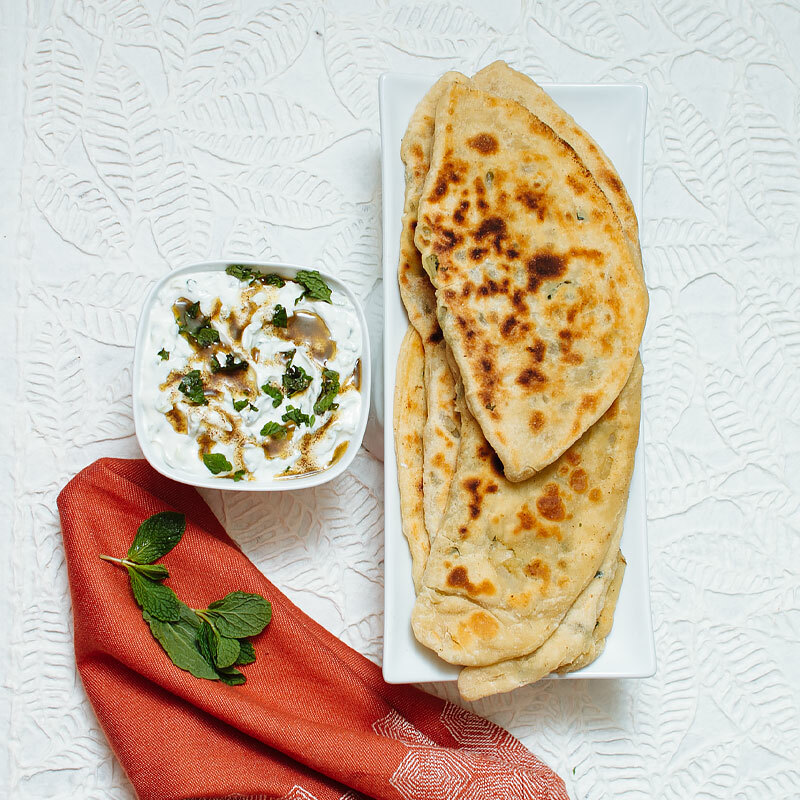 Kulcha can be found with many different fillings, from potato to paneer. This version is a combination of onion, mint and chilis. To cool off the heat of the chilis, I’m pairing it with a cucumber lime yogurt. 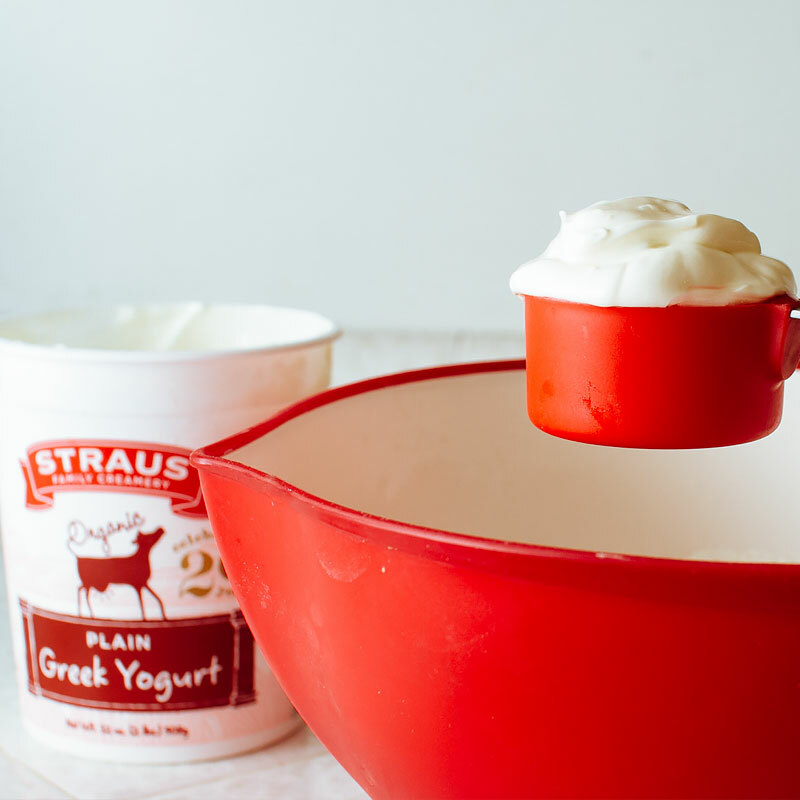 In both the kulcha dough and the dip, I’m using organic whole-fat yogurt from Straus Family Creamery. A little bit about Straus – they have a wide range of sustainable practices that aim to preserve organic integrity, reduce the carbon footprint, support family farms and take responsibility for what is happening in local communities and in the food system at large. In 2010, Straus Family Creamery became the first creamery in the US to verify all our participating farms as Non-GMO Project Verified. Awesome, right? San Diego friends, you can find Straus products at Sprouts and Whole Foods. BTW, the yogurt sauce would pretty much be good on ANYTHING. Feel free to buy some pre-made naan and dip away! 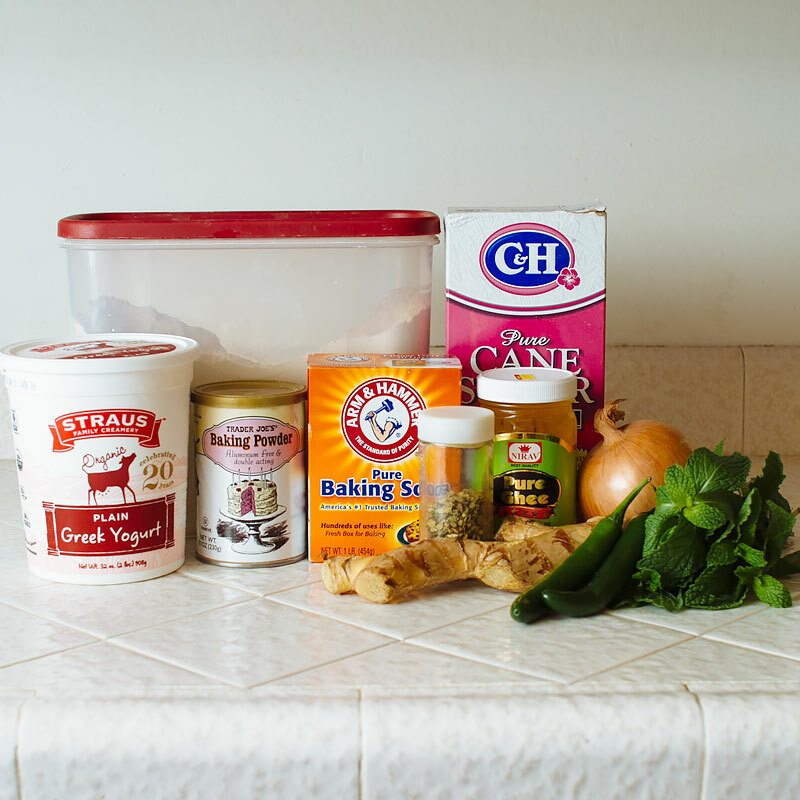 For the kulcha, you’ll need greek yogurt (I’m using Straus Family Creamery Organic Greek Yogurt, the plain, full-fat version), flour, baking powder, baking soda, sugar, salt, ghee, onion, mint, serrano chilis, ginger and oregano. Start by combining all of the dry ingredients for the kulcha in a medium bowl – flour, sugar, salt, baking powder and baking soda. Stir to combine. Now stir in the wet ingredients – the greek yogurt and the ghee. 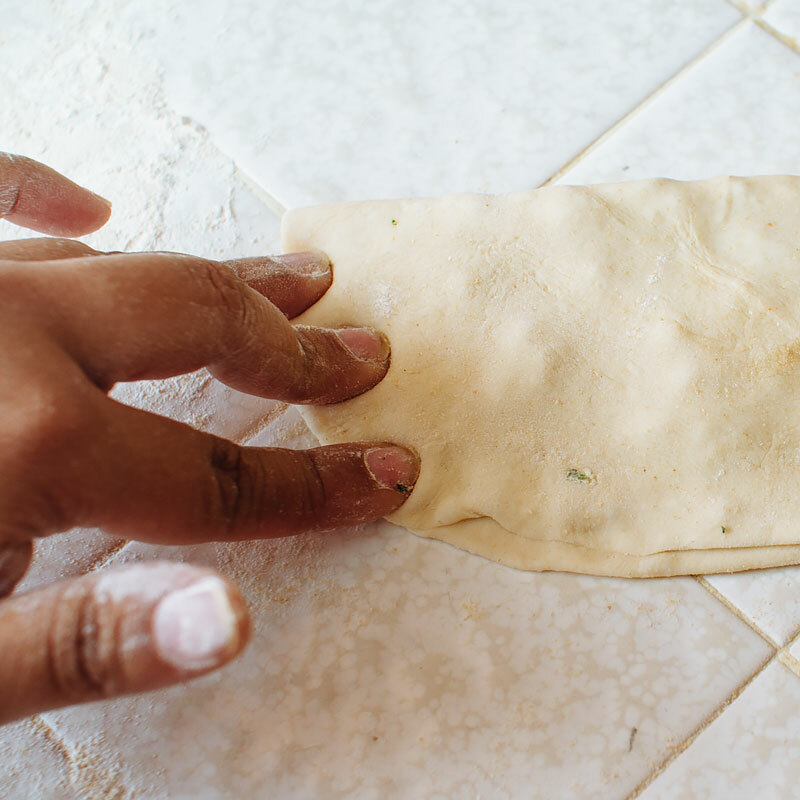 Add enough water to form a soft, sticky dough. I used about 1 cup. It’ll look a little rough, but that’s okay. Knead on a lightly floured surface for about 5 minutes, until smooth and elastic. Place in an oiled bowl and cover. Let rest for 1 hour. While the dough is resting, make the filling for the kulcha and the yogurt sauce. 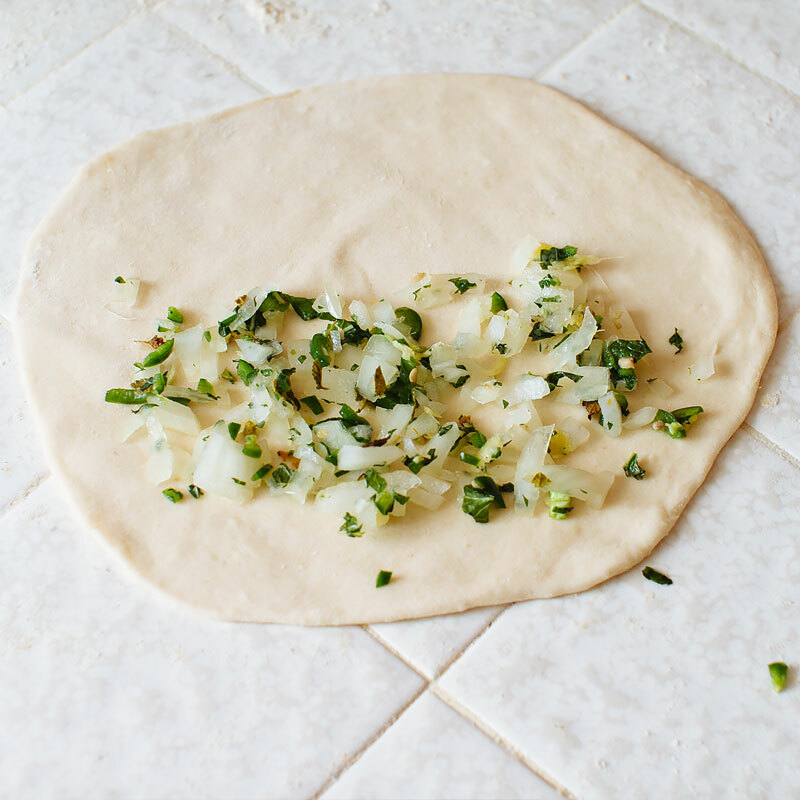 For the kulcha filling, combine the chopped onion, chili, mint, grated ginger and oregano. Set aside until the dough is ready. 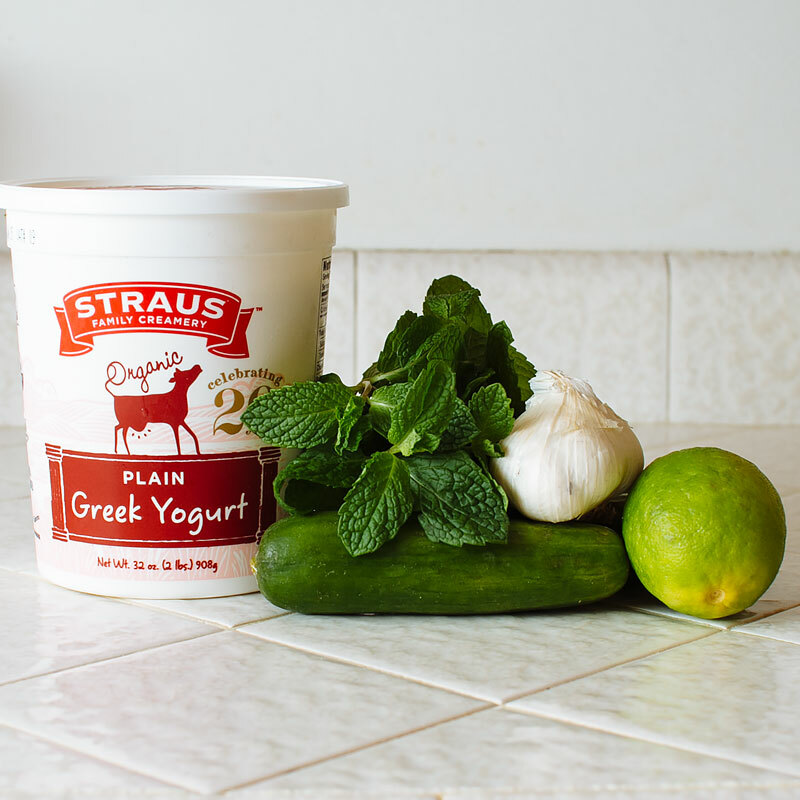 For the yogurt, you’ll need Greek yogurt, mint, garlic, lime, cucumbers and kosher salt. Grate the cucumbers and sprinkle about 1/4 tsp of kosher salt. Massage the salt into the cucumbers and let drain in a colander for 20 minutes. Squeeze out as much water as you can. There’s a lot. In a small saucepan, heat butter over medium heat until browned and nutty, about 5 minutes. Combine the yogurt, garlic, most of the mint, most of the butter (save a bit of each for garnish), zest and juice of 1 lime, and the drained cucumbers. 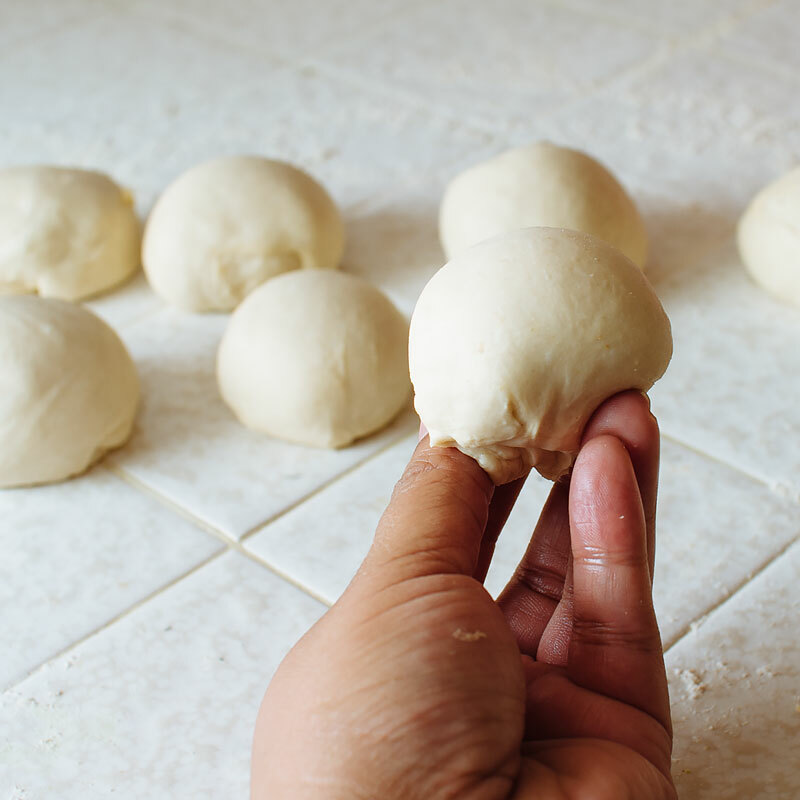 Divide the dough into 10 evenly sized balls. Let them rest for 10 minutes. Lightly flour both sides of the dough, as well as your work surface. Roll out the balls until they’re about 6″ in diameter and this thin. I don’t know how much this is. I’ll guess 1/8″. Sprinkle about 2 tbsp of the filling on one side of the dough. 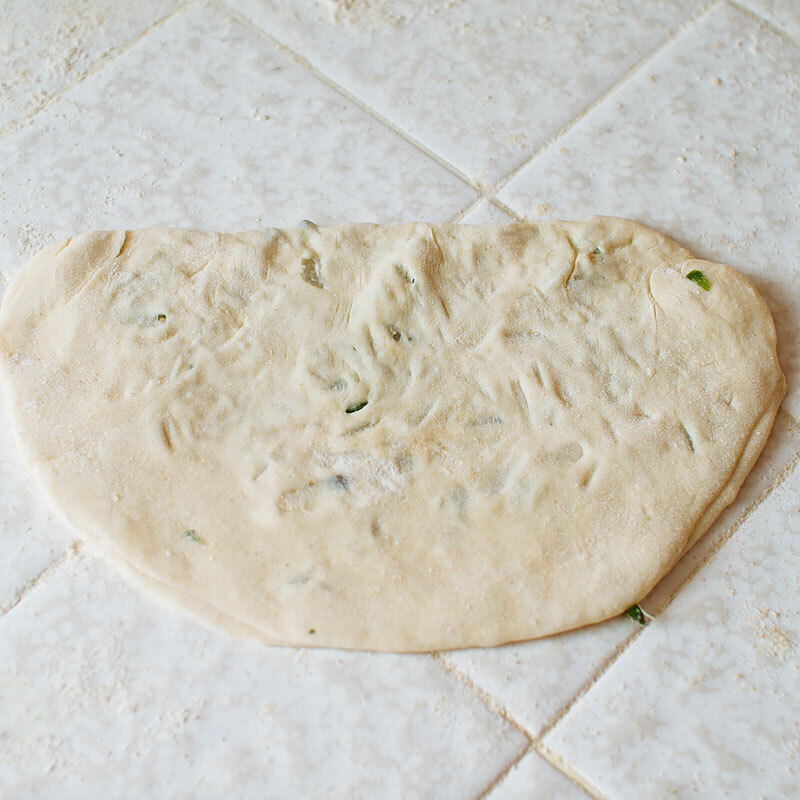 Fold the other half of the dough over the side with the filling and press edges firmly to seal. 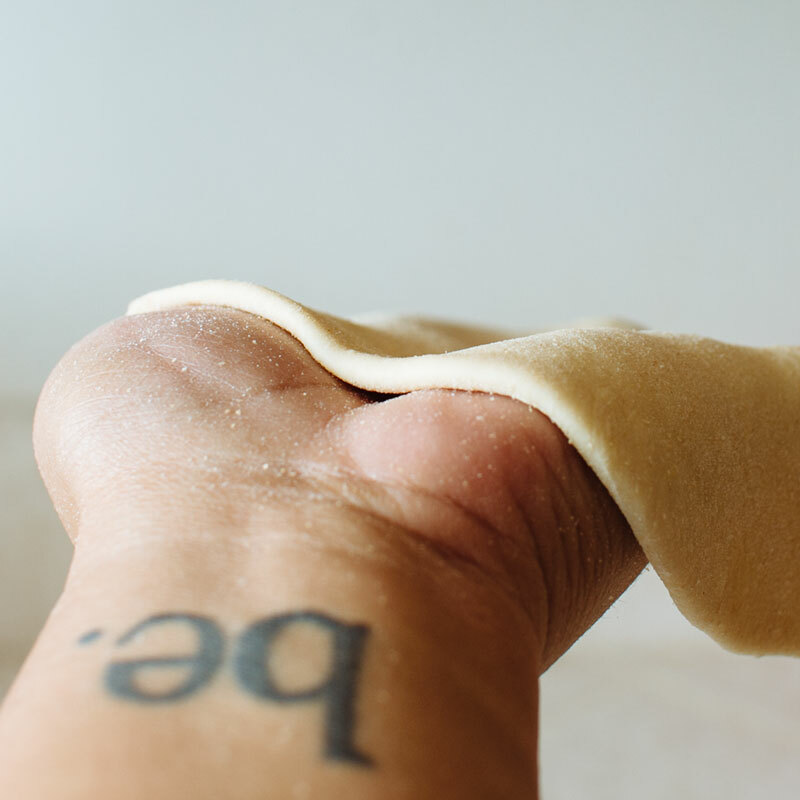 Roll the filled dough out into an oval-ish shape. Don’t worry if some of the onions start poking out. That’s just fine. Heat a cast-iron skillet (or other heavy-bottomed pan) over medium-high heat. 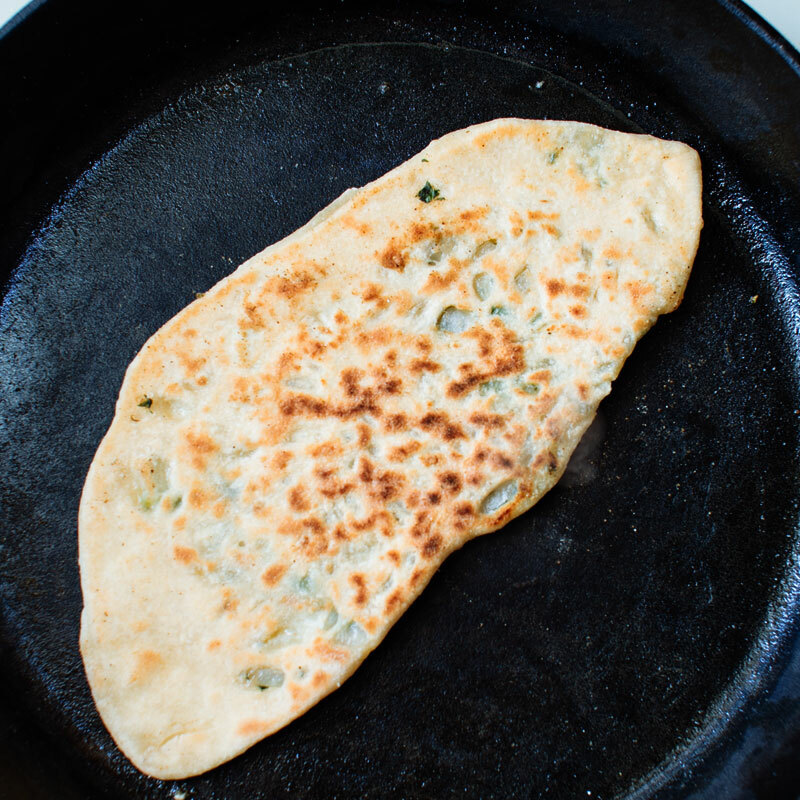 Add a tiny bit of ghee or vegetable oil to the bottom of the pan and cook the kulcha until bubbles begin to form on the surface and the bottom is browned well. It’s pretty much like cooking pancakes. Flip and continue to cook on the other side. Top the cooked kulcha with a little bit of ghee or butter. 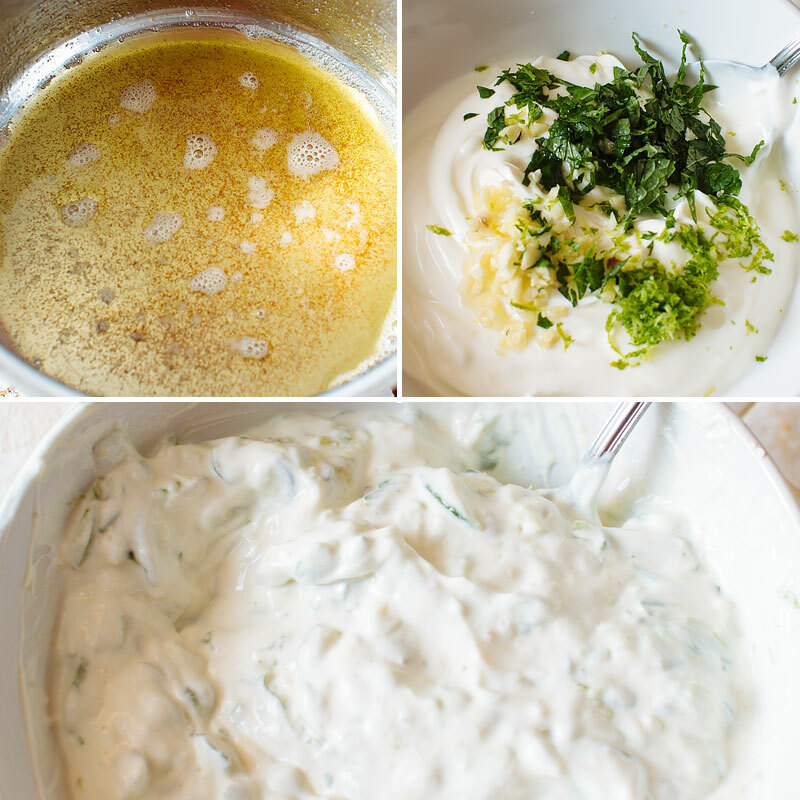 Garnish the yogurt sauce with the remaining chopped mint and browned butter. Confession: I basically made the kulcha so my fingers wouldn’t get dirty eating all the yogurt. 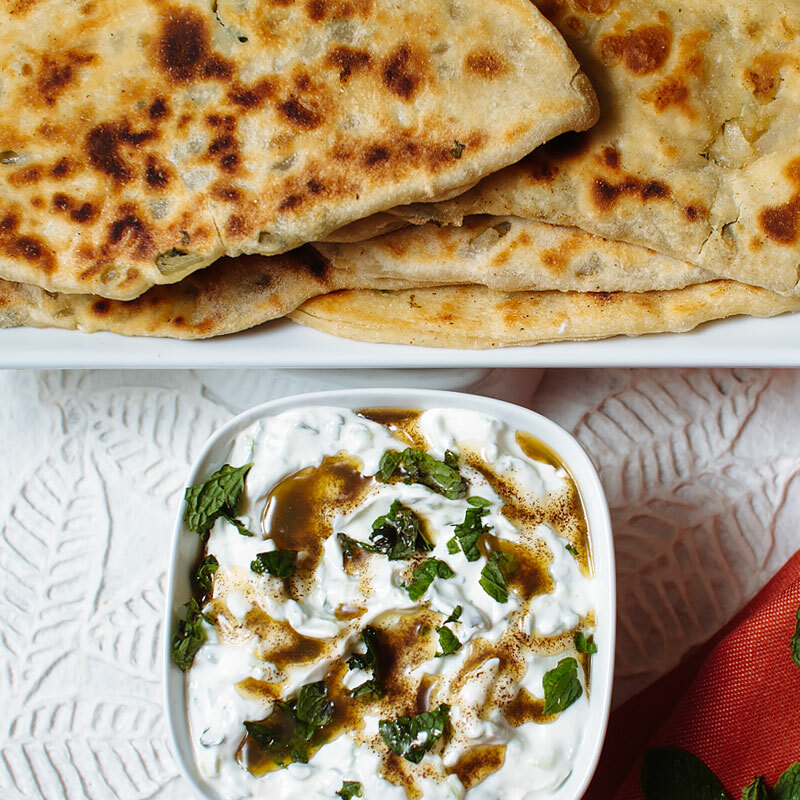 Indian flatbread stuffed with onion, chilis and mint, and served with a cucumber lime yogurt sauce. 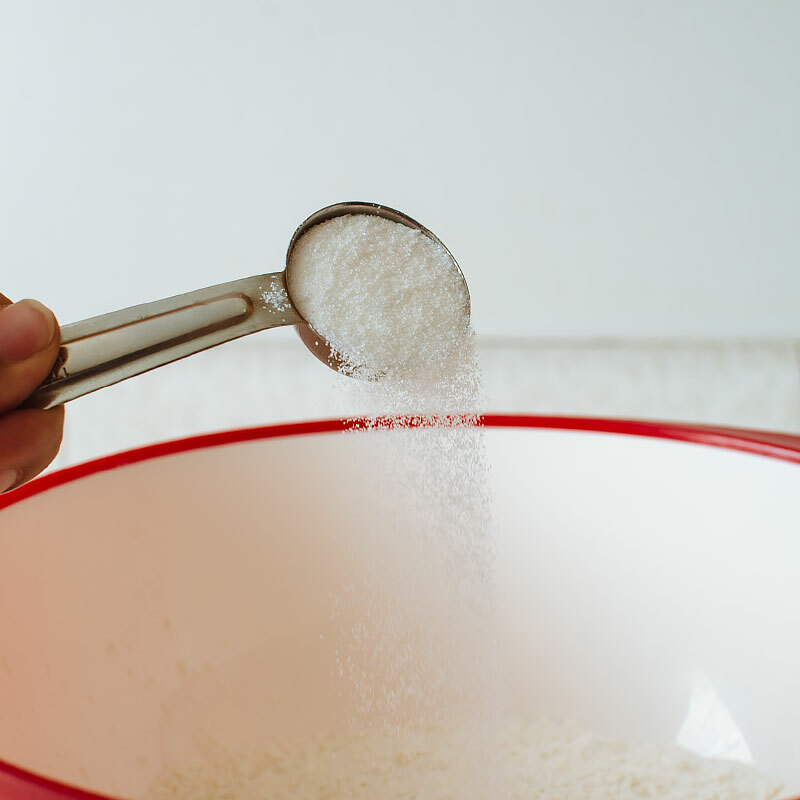 In a medium bowl, add the flour, baking powder, bakign soda, sugar and salt. Stir to combine. Add in the vegetable oil, yogurt, ghee. Stir to mix, adding in water until a soft dough forms. I added about 1 cup of water. The dough will look a bit rough and be quite sticky. 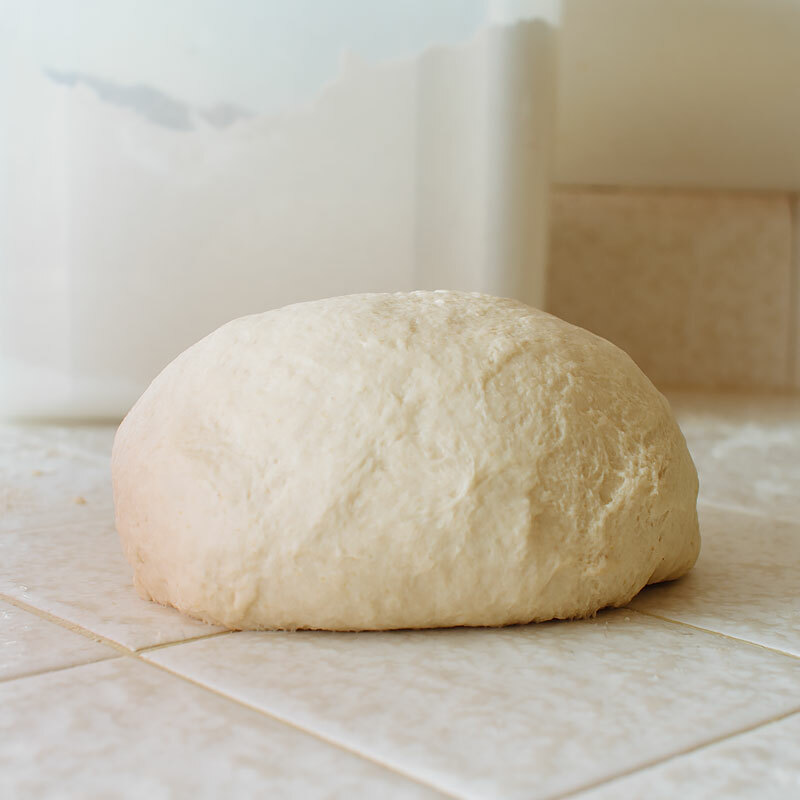 Turn the dough out onto a lightly floured surface and knead until smooth and elastic, about 5 minutes. Place in an oiled bowl, turning the dough in the bowl to coat with oil, and cover. Let rest for one hour. 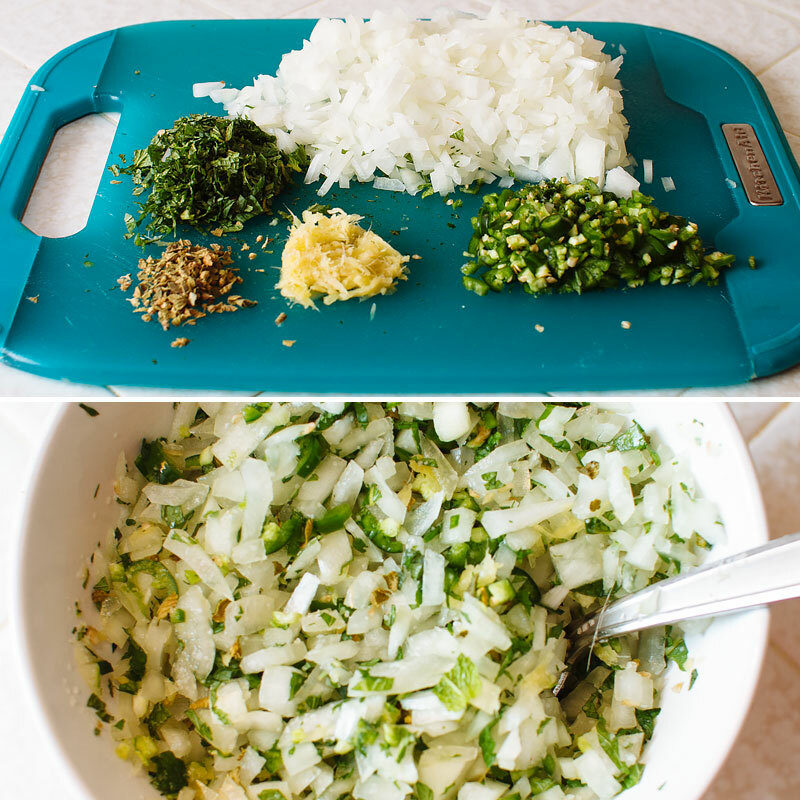 For the filling, combine the chopped onion, chopped mint leaves, finely chopped chilis, oregano, salt and ginger. 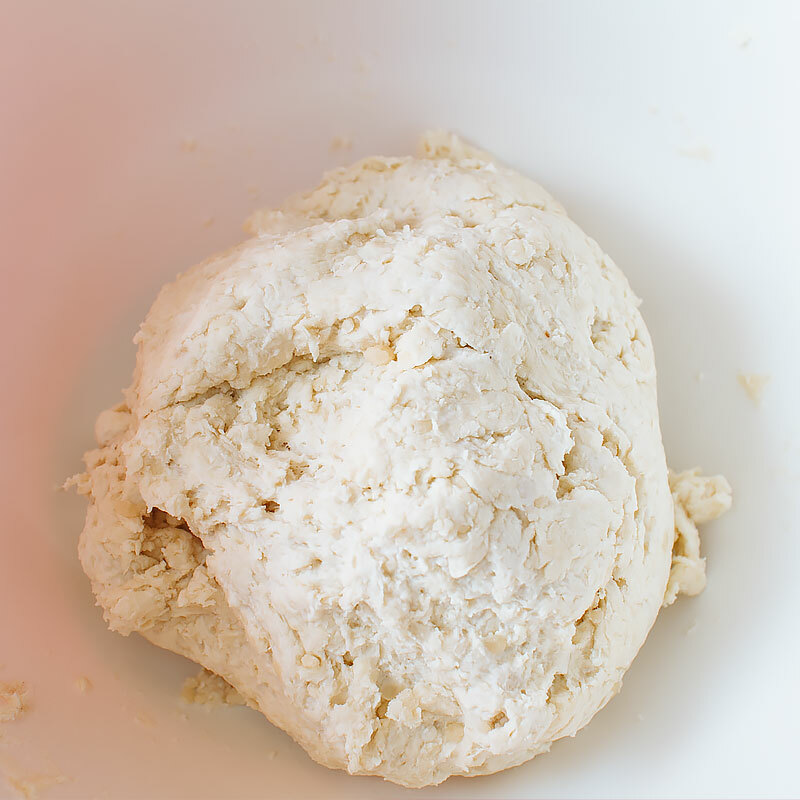 Once the dough has rested, divide into 10 equal pieces and shape into balls. Let rest an additional 10 minutes. 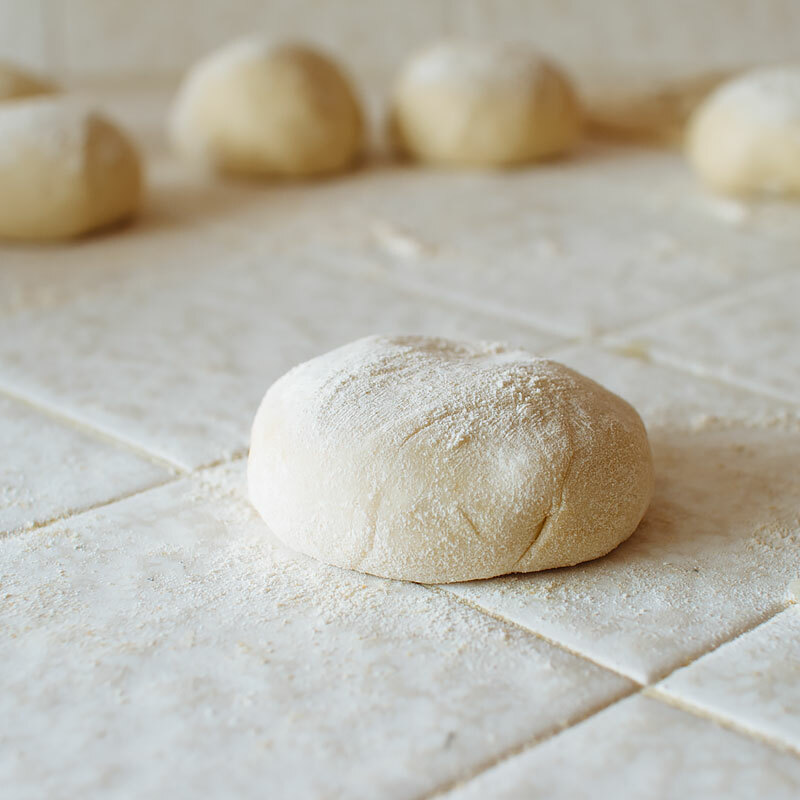 Lightly sprinkle flour on both sides of dough ball and roll out into a circle, about 6" in diameter. Sprinkle about 2 tbsp of the filling on one half of the dough round, fold the other half over and press firmly along the edges to seal. 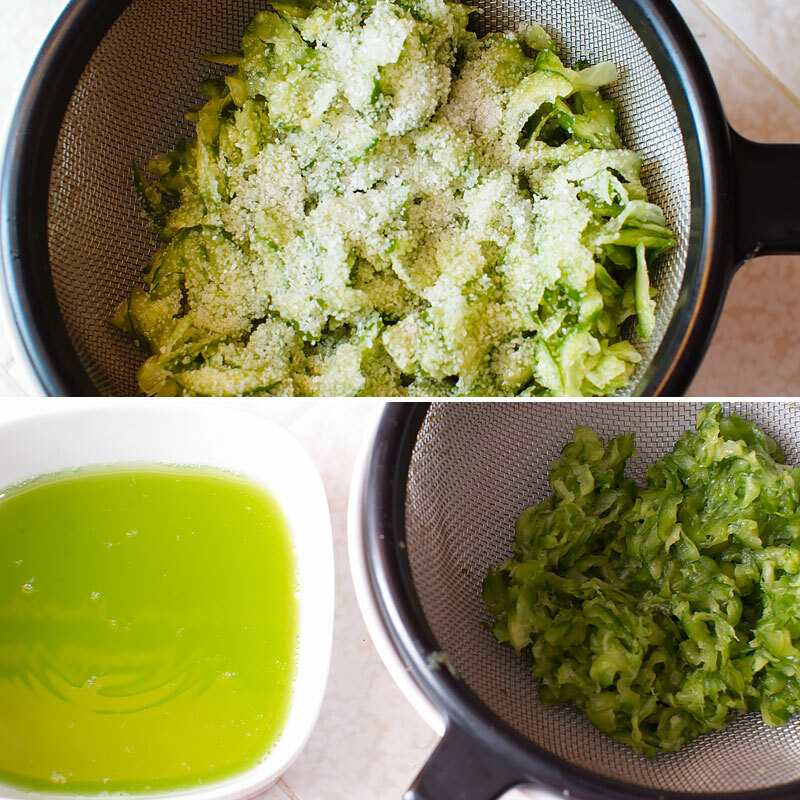 In a cast-iron skillet (or any other large, heavy bottomed pan), place a bit of ghee or vegetable oil. 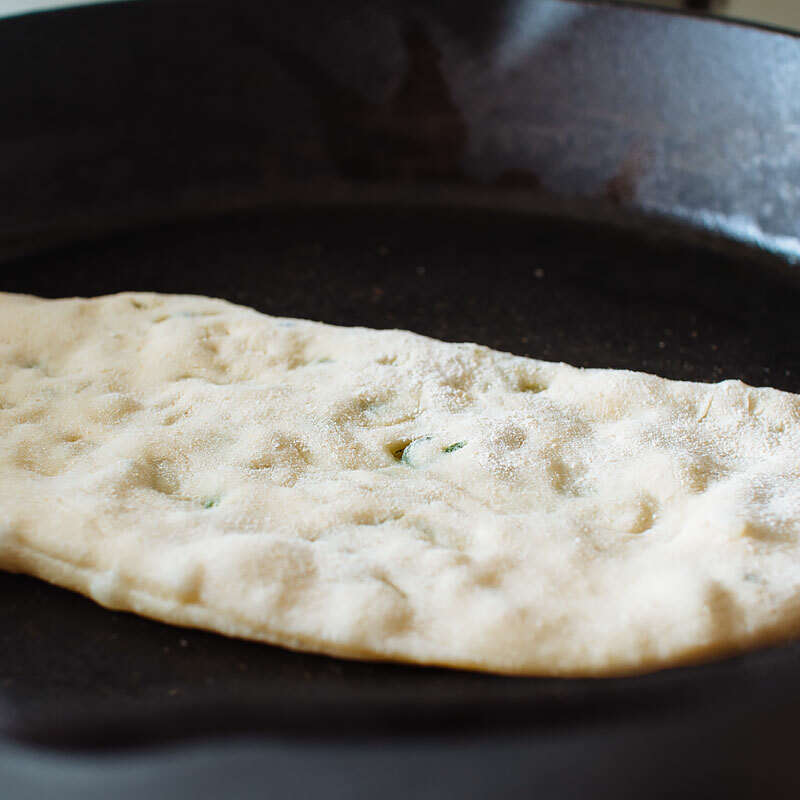 Cook the kulcha over medium-high heat until bubbles begin to appear on the surface and the bottom has browned nicely. Flip and continue to cook until browned - about 5 minutes per side (keep an eye on it!). Brush the top of the cooked kulcha with a bit of ghee or butter. Serve with cucumber lime yogurt (recipe below). Place the grated cucumber in a colander, and sprinkle 1/4 kosher salt over. Massage the salt into the cucumber and let drain for 20 minutes. Squeeze out as much of the water as you can. In a small saucepan, cook the butter over medium heat until it smells nutty and takes on a brown color. 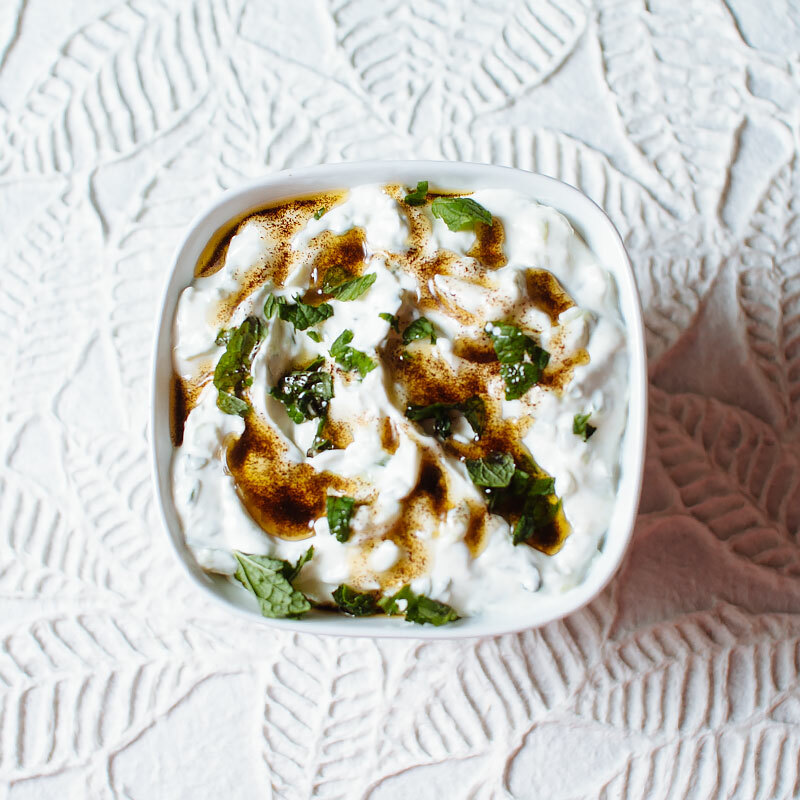 In a medium bowl, combine the yogurt, zest and juice of one lime, garlic and most of the mint leaves and most of the butter, reserving some of each for garnish. Top with remaining mint and drizzle the remaining butter over the top. Mmm, I’d so eat the hell out of these kulchas!! Oh man, I agree with Brandon! This looks awesome and those Kulchas are to DIE FOR. Yep, they’ll be my next bread-making endeavor. These remind me of Chinese scallion pancakes, it’s like the Indian version 🙂 Have you ever had scallion pancakes? Looove those things. My dad loved them so for Father’s Day when one year I made them for him and have been making them ever since! YES!! I love the Chinese scallion pancakes! I haven’t made them yet, but I think the preparation is similar with the addition of rice flour? That might be on the list of things to make this week!